A team of Magpie greats. 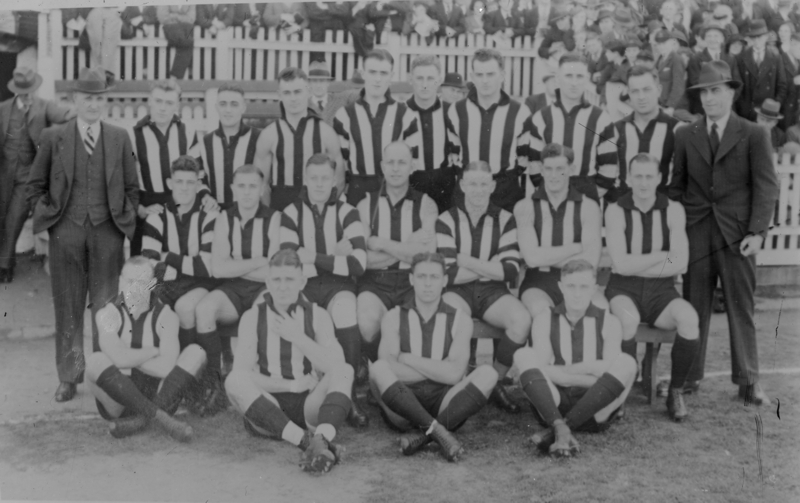 This is the Collingwood (VFL) First Eighteen, almost certainly photographed 1934. The photo shows Jock McHale, Sid and Gordon Coventry, Harry and Albert Collier, and a very young Phonse Kyne. Sid Coventry finished at Collingwood in 1934 and Kyne started that year. Taken on match day. Big crowd. Nineteen players. Black shorts. The team photo includes Wally Tyrrell who played only one VFL match, so this must be Round 2, 12-May-1934 at Victoria Park. Essendon led by 4 points at the end of the first quarter, but Collingwood kicked 4 goals to none in the second quarter to set up a 20 point margin which they held for the rest of tha match. Collingwood came into the game having lost their Round One match to South Melbourne by 35 points. South would beat Collingwood twice more in 1934, again in Round 12 by 48 points and again in a tight semi-final, where South scraped home by three points. 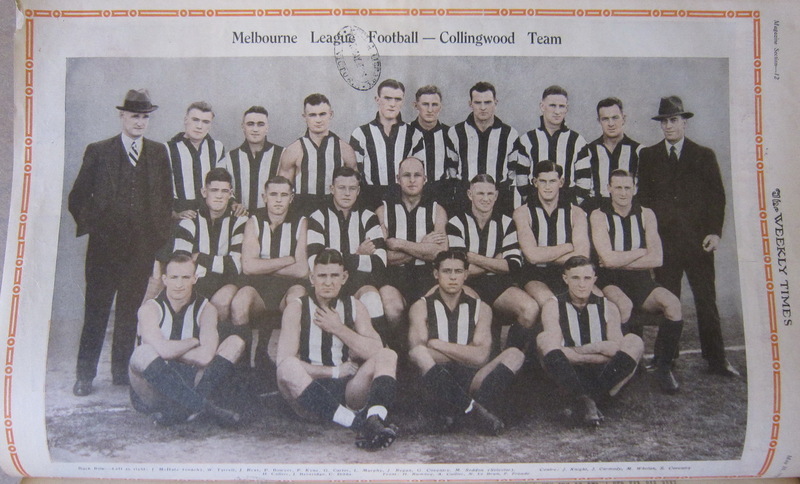 Assuming that this is Collingwood 1934, that the Black shorts indicate a home game and assuming that Andy Pannam is not in the team, there are only about 4 possible games that this could be taken at. This should help identify other players.